Editor/Author Phelan, James and Rabinowitz, Peter J. 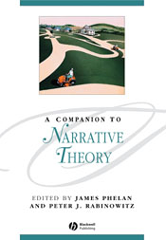 The essays in A Companion to Narrative Theory constitute the best available introduction to this vital and contested field of humanistic enquiry. Comprises original essays written by leading figures in the field. Includes contributions from pioneers in the field such as Wayne C. Booth, Seymour Chatman, J. Hillis Miller and Gerald Prince. Represents all the major critical approaches to narrative and investigates and debates the relations between them. Considers narratives in different disciplines, such as law and medicine. Features analyses of a variety of media, including film, music, and painting. Designed to be of interest to specialists, yet accessible to readers with little prior knowledge of the field.